Nam Man Prai is a term used for all kinds of magical oil based potions in Southeast Asian Necromantic Sorcery. There are various kinds of Nam Man Prai, some of which are necromantic in their creation and empowerment methods, others, are from the plant kingdom, but still considered Necromantic, as many will come from plants which have died from unnatural or mysterious circumstances, and are believed to have ‘Sing Sathit’ deva and Ghost spirits dwelling within them, hence, dead Spirits are involved in Prai Sorcery, be it Human Necromancy, Animist Necromancy, or Plant Kingdom Based Necromancy. 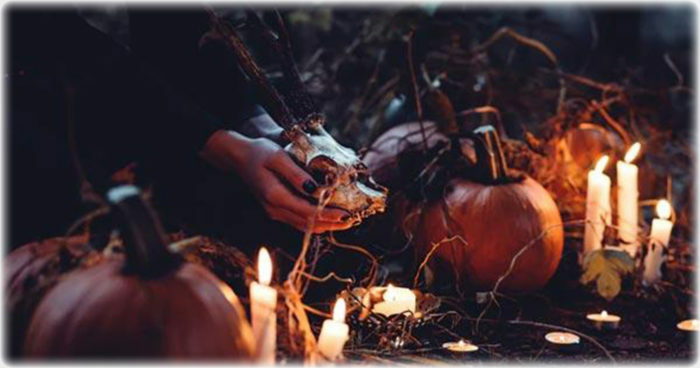 In Modern times, it is very rare to encounter true necromancy for it breaks various laws, and so most necromantic amulets these days are not made using the ancient black magick methods anymore, rather, use auspicious alternatives to achieve the same results. There are however exceptions, especially with Lay Masters, as can be seen from the fact that various laymasters have been arrested and prosecuted, for practicing necromancy with human remains without certificate of death or permission from the relatives to use the remains for amulets. Hence, true Nam Man Prai can still be found by those in the scene who seek avidly, and have their contacts, but is very much an underground niche. 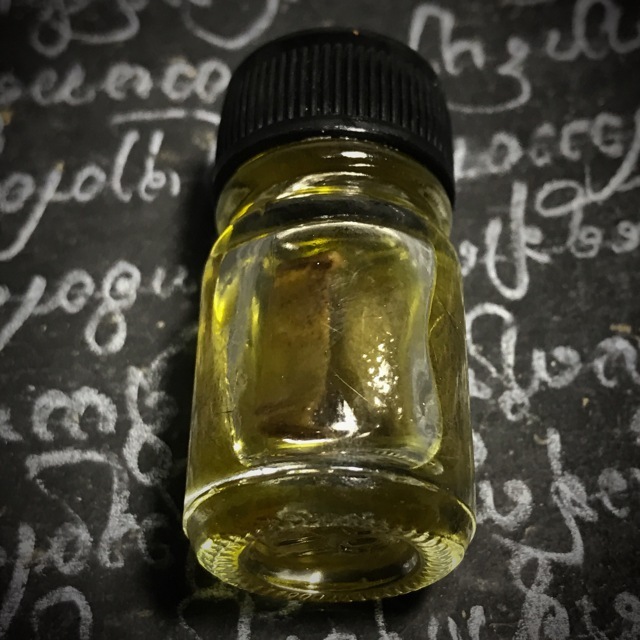 This kind of Nam Man Prai Oil is extracted from under the chin of a corpse of a person who ‘died screaming’ meaning the person died in fear or stress, before their time, in unnatural circumstances. This term is also used for ‘Phii Dtaay Hoeng Tang Glom‘, which is a variation that requires the corpse of a woman who died unnaturally (Dtaay Hoeng), during pregnancy, with both mother and child deceased in the process, and buried alive together. 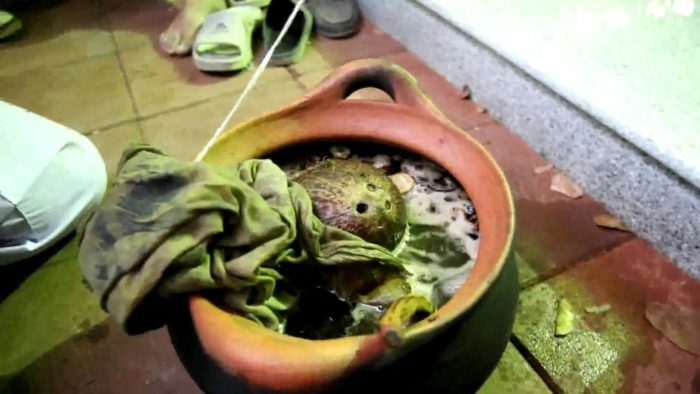 The oil is extracted using Ritual Necromantic Sorcery methods performed by a ‘Hmor Phii’ (Witch Doctor) Necromancer in a Graveyard, by subduing and appeasing the ruling guardian demon of the cemetery to give permission to enter and perform the ritual extraction from one of the corpses within the cemetery. The ritual is first performed, and if successful, the Necromancer will take his team to help dig the grave, but before this, he must remove the two curses and find the one true key enchantment which he needs to destroy to be able to raise the dead from the grave..
Once he finds the three hidden stones, two of which are inscribed with fake spells, and only one which hjas a true curse within it to prevent grave robbers, and to prevent the ghost in the grave from escaping, the Necromancer will deactivate the spell, and get his team of helpers to dig up the coffin. The helpers must then stand back at a distance, as when the coffin is opened, the spirit of the angry Phii Dtaay Hoeng flies out and looks for a victim to launch its anger at, and must be subdued by the Necromancer to obey and nserve the Buddha Dhamma through empowerment of amulets to help humans. 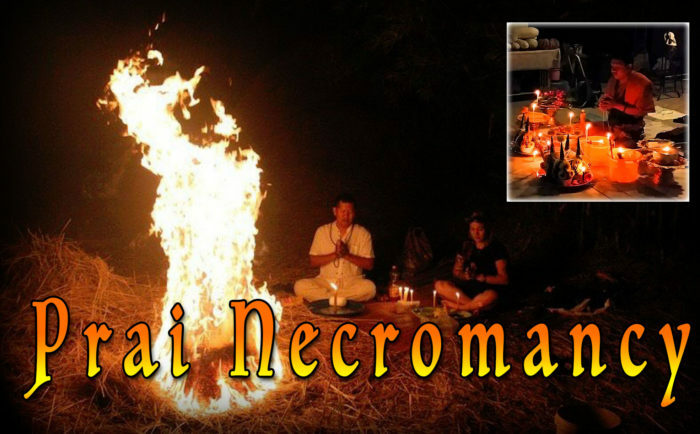 Once this is achieved, the Necromancer then raises the corpse and uses a candle flame and a receptacle to heat under the chin of the corpse where the oils have gathered, and drip them onto the receptacle, for later dilution with other herbal based Prai Oils, or for mixing with Muan Sarn Sacred Powders and Bone Powders of Kumarn Tong or other necromantic animist charms. 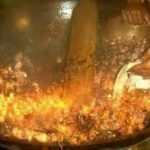 Nam Man Prai Kumarn Tong, is the fat extracted directly from a baby who was killed in violent or sudden circumstances, often by roasting the Kumarn over a fire. This is often used to mix into the Kumarn Tong amulets, as well as other love charms and attraction spells. 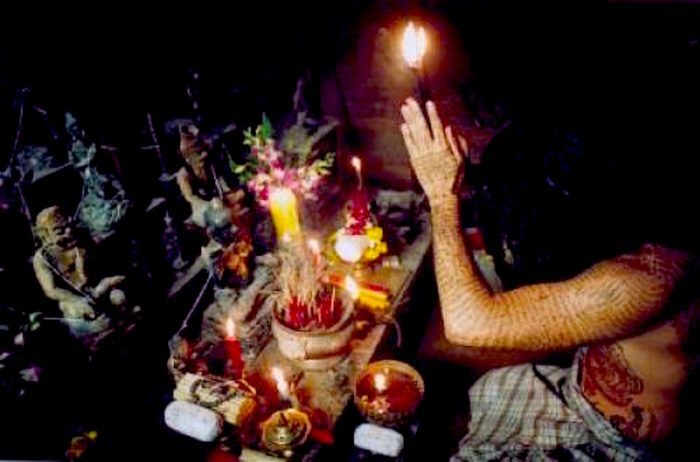 Sacred oil is given extra magical charging by adding various magical objects and substances to soak in the oil. 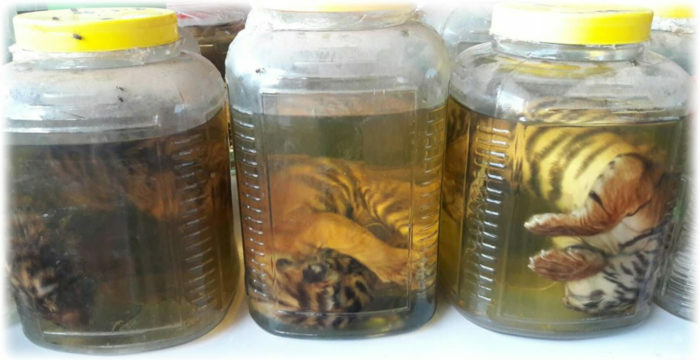 However, Nam Man Prai Phi Dtaay Tang Glom is also considered to be Kumarn Tong Oil, it is just a matter of whether the necromancer has access to the corpse with the Kumarn inside her, or just the Kumarn foetus. Tiger Oils are very popular since ancient times to the present day, but are of course now very rare, sue to the protection of tigers, and the very few occasions a tiger dies naturally and a temple receives the corpse donated is so rare these days, that most tiger oils will be made using tiger related parts which are not forbidden (e.g. fur with no skin, bone). Old tiger oils from the olden days masters of the world of Ancient Amulets can be found to contain the true tiger oils within them. But these days, even they must be owned with a certificate of permission from the Wildlife Protection Ministry section of the Thai Government. Tiger Oil is seen to be powerful Maha Amnaj Commanding Power, Klaew Klaad Kong Grapan Chadtri Evasion and Invincibility, but also Metta Maha Niyom mercy Charm, and Maha Sanaeh Seductive Influence, Maha Pokasap treasures, with Serm Yos Serm Baramee Promotion and Status Increase. Sacred Nam Man Prai – Necromantic and Herbal Prai Oils, Metta Oils and Nam Man Prai Based Lip Gloss Balms for Maha Sanaeh and Metta Maha Niyom Mercy Charm, Siang Choke Gambler’s Luck, and Gae Aathan Anti Black Magick.